There's nothing worse than biting excitedly into your indulgent restaurant-style burger only to find a soggy mess of a bun on your plate. The conundrum of keeping a patty moist but bun dry has perplexed home cooks and chefs alike, and even top burger joints are guilty of soggy-bun syndrome. Not to worry. Just follow these tricks to guarantee a juicy burger that won't have you reaching for the stack of napkins or leave you with a mouthful of soggy disappointment. As the vehicle which carries your patty, the bun is of utmost importance. Most commonly potato bread, brioche, or other soft buns are used, but often their spongy consistency attracts the moisture from the patty rather than repelling it. 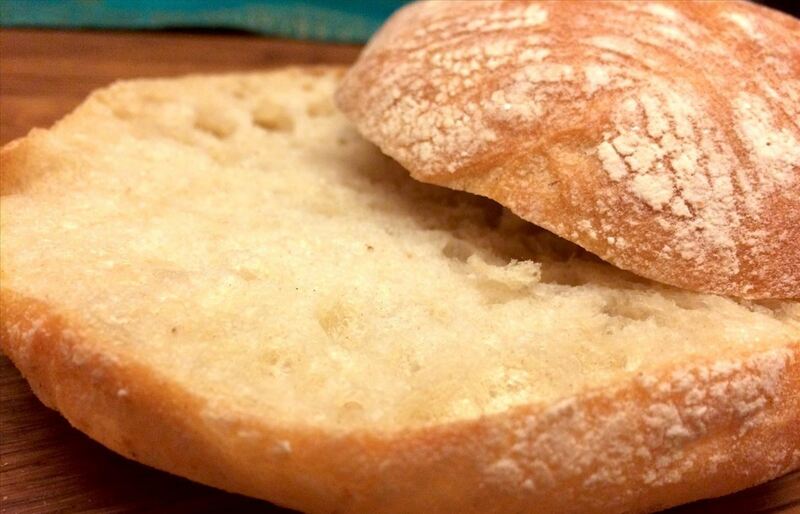 One way to avoid a soggy bun is to opt for a sturdier bread, such as ciabatta or a rustic French roll. Peter Endriss from Brooklyn's Runner and Stone Bakery tells Kitchensurfing.com, "I would say that the leaner dough (pain au lait) would go better with a fattier burger and the fattier dough (the brioche), with a leaner, more savory burger. The fat from the fattier burger would be soaked up better by the pain au lait bun and the butter in the brioche bun would cut/mellow spicier/saltier/more acidic flavors in a more savory burger." 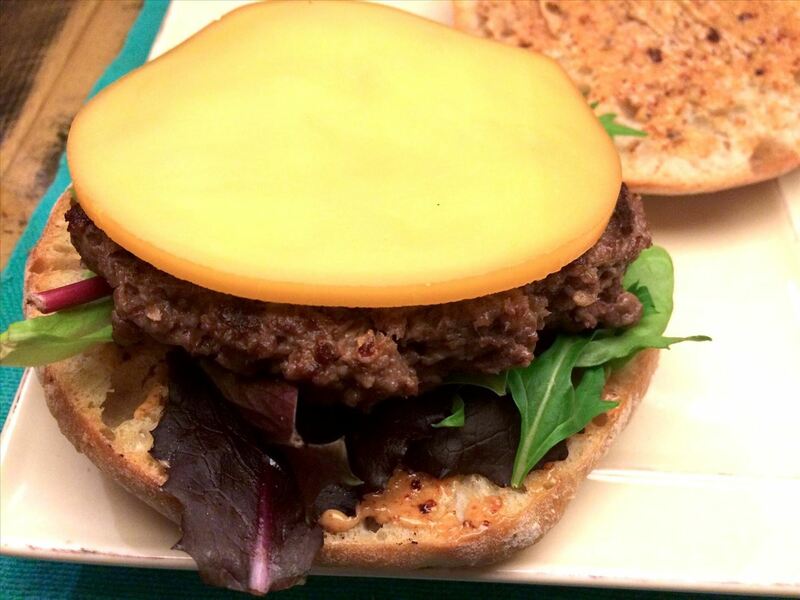 For many burger enthusiasts, the chewiness of a crustier bread as pictured above undercuts the point of a burger—which is to be able to eat it without battle. If you're on that team, don't worry. There are still many ways by which you can get a juicy patty while keeping your pillowy-soft bun as dry as possible. Read on. 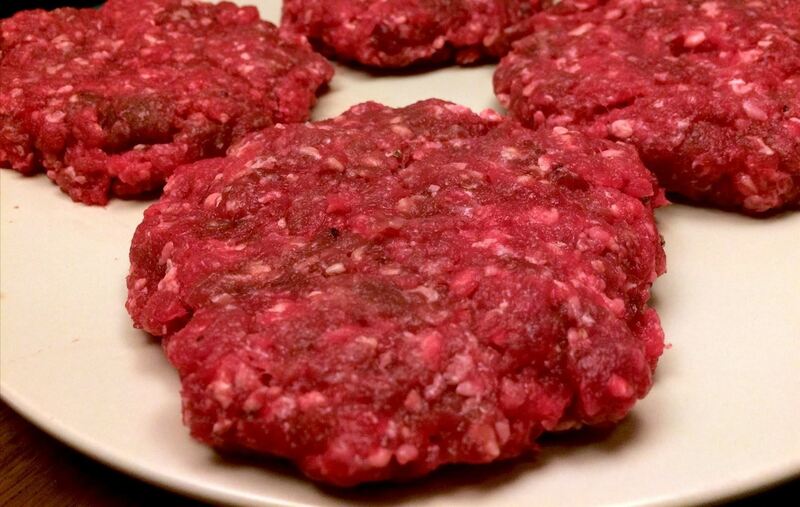 Fattier meat is certainly juicier and often the best choice for a good burger. Once Upon a Chef recommends 85% lean ground beef. Because of the excessive juices that drip out from a very fatty patty, burger cooking times will make or break your patty. Even if you are a rare meat enthusiast, picking a grind that's high in fat and then choosing to cook it rare is a recipe for disaster. It will taste delicious, sure, but it is definitely going to make a bloody mess on your plate. There are two solutions to this problem: Pick a leaner beef blend (about 90% lean) and cook it rare, or pick a fattier (80-85% lean) ground beef and cook it somewhere between medium and well, around three minutes on each side. You love your burger, but it doesn't love you back. 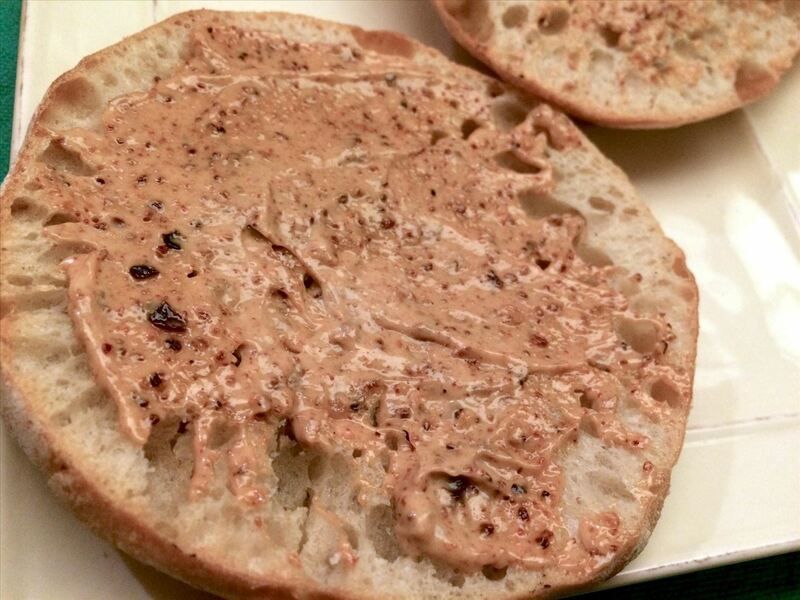 Resist the urge to flip it more than once, or to squeeze the juices out with a spatula. Excessive handling of your patty will force the juices out, leaving you with a dry burger. Not you, the patty! As J. Kenji López-Alt of Serious Eats explains, during the process of cooking meat, the juices are forced towards the center. If cut open (or bitten into) before the meat has had a chance to rest, the juices flow out and sap the meat of its flavor. 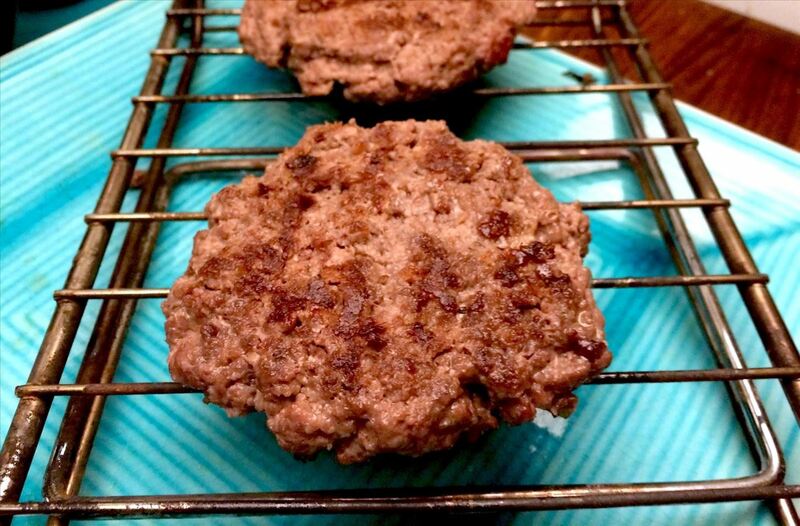 By simply resting your patties on a rack for a few minutes, the juices are redistributed around the burger, allowing the flavors to permeate more gradually. This also allows for any excess fat and juice to drip away from the patty, so by the time you put it on your bun, the extra liquid will be gone. I cannot stress how important it is to rest your patty. Even a few minutes on a rack will go a long way in keeping the liquid mess off your bun. If you follow only one of these steps, let it be this one. Toasting your bun gives you an added layer of protection against moisture. When you toast bread, a chemical reaction known as the Maillard Reaction takes place, expelling moisture from the bread and essentially changing its chemical structure. This newly structured bread, aka toast, is the perfect companion to a juicy burger because the already reduced levels of liquid in the bread prevent it from taking on a sponge-like consistency. You can create another shield between your juicy burger and your dry bun by spreading a layer of fat like butter, mayo, or another fat-based condiment on your bun. This protects the surface of the bread, preventing the juices from seeping in. Sliced cheese works, too (see below). The final step in this burger extravaganza involves layering it right. Once you've added your oil slick, consider putting a layer of lettuce down as an extra juice-mitt. The Mountain Kitchen shows how to use a whole leaf of lettuce under your patty to catch the juice, preventing it from getting into your bun. But baby lettuces work almost as well. While they don't catch the juice the way a big leaf of lettuce would, they do create an extra barrier between the burger and the bun. Likewise, sliced cheese should also be layered against the bread. Like butter and mayo, this fat-packed food creates a moisture-proof barrier between your burger and the bun. Juicy additions like sliced tomatoes or pickles should be layered as far away from the bread as possible. Now that you've followed all the protocol, you should have a perfectly juicy burger and a perfectly dry bun. But you can still make a mess by eating it wrong. Our guide on how to eat a burger correctly demonstrates how to use your thumb and pinkie properly to prevent too much pressure being exerted on the burger. Holding it upside down has also been known to help avoid fluid overflows. 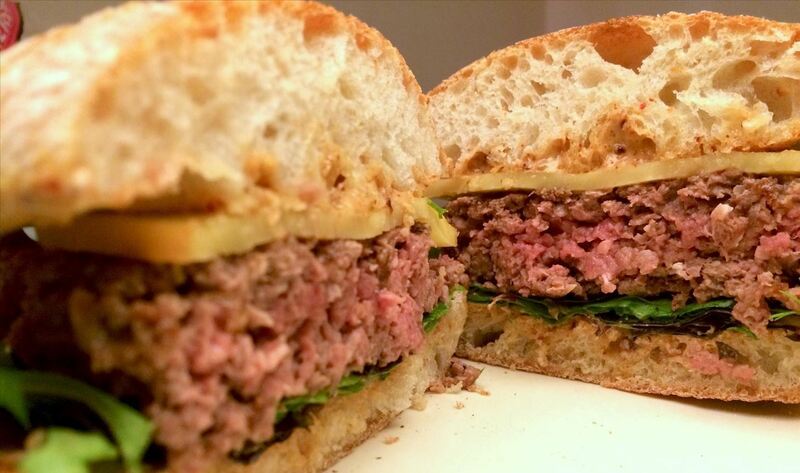 Want to Perfect Your Burger Game? Use your thumb to get perfectly shaped, non-bulging patties. Smash your patty for even more flavor. And try this trick for perfectly juicy burgers every time.